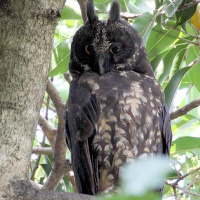 The Stygian Owl is a medium-sized to large owl with prominent, erectile ear-tufts. The adjective Stygian means 'gloomy and dark' and refers to the river Styx, which, in Greek mythology, the souls of the dead cross to reach the underworld. Typical call - Silves, Amazonas, Brazil. July 2013. CC Thiago Bicudo. Description: The facial disc is dusky brown, with a finely white-speckled lateral rim. Eyebrows are prominent, short and whitish. Eyes are yellow to orange-yellow. The cere is greyish-brown and the bill blackish. Ear-tufts are long and prominent. 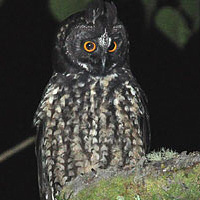 Upperparts are dark sooty-brown, with the forehead and crown mottled pale. The mantle and back are nearly plain, with indistinct pale feather edgings, and the outer webs of the scapulars having faint spots. The primaries are nearly plain dark brown with rows of indistinct paler spots, while the secondaries are barred light and dark. The tail is sooty-brown with a few paler bars. Underparts are pale buffish, heavily bared dusky on the breast and the rest with dark shaft-streaks and cross-bars. Tarsi are feathered, and the brownish-flesh toes are partly feathered with short plumes. The claws are dark horn with blackish tips. Size: Length 38-46 cm. Wing length 291-380mm. Tail length 165-198mm. Weight 691-675g. Females are larger and heavier than males. Habits: Essentially nocturnal. It roosts during daytime in dense vegetation, but seems to be active mostly in more open vegetation. When alarmed, its ear tufts stand erectile, but when relaxed they can be almost invisible. Stygian owls fly with fairly slow wing beats, and occasionally glide over some distance. Voice: A deep "whuof" with a descending inflection is repeated at intervals of several seconds by the male. The female occasionally utters a shrill call "miah", in response to the male. Both sexes vocalize "wak-wak-wak" when excited. Females and young produce a "cheet" when begging for food. Hunting & Food: Feeds on bats, and birds such as doves, as well as small mammals and insects. Populations from south-east Brazil appear to prey mostly on small gregarious birds such as grassquits and other passerines. Birds are taken at their night time perches, detected by their own involuntarily sounds when touching the foliage. 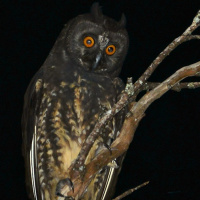 Stygian Owls normally hunt from a perch. Bats are captured on the wing. Breeding: Little known. It seems to be able to nest both in trees and on the ground. 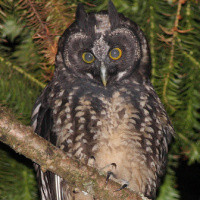 This owl was observed using abandoned nests of other birds in trees. During the courtship period, male claps wings under body in flight. Female lays two eggs and incubates them alone. Both parents feed the young. Juveniles appear to have a deep blue pupil. Mortality: Human persecution is probably the major cause of unnatural deaths. 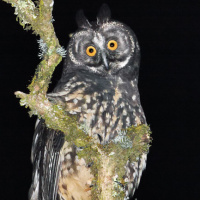 Stygian Owl characteristics such as long ears tufts, dark coloration and particularly the brilliant red reflection of the eyes when illuminated by lamps have been associated with the Devil. 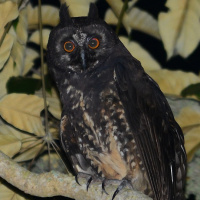 As an example, its vernacular name in Brazil is "coruja-diabo", or "devil's owl"! 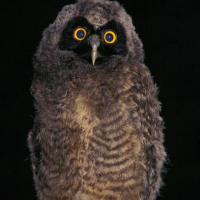 Habitat: It is said to be a forest owl, commonly found high in the mountains. It also occurs in humid and semi-arid forests, in fully developed tropical rain forest and in low, thorny bush country from about 700m up to 3000m above sea level. Usually absent from lowlands. 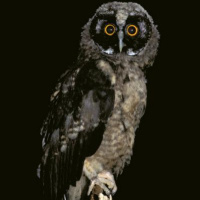 On the other hand, field observations in south-east Brazil and Belize showed Stygian owls hunting mostly in savannah-like habitats. Thus, forests may be mostly used as roosting sites during daytime. 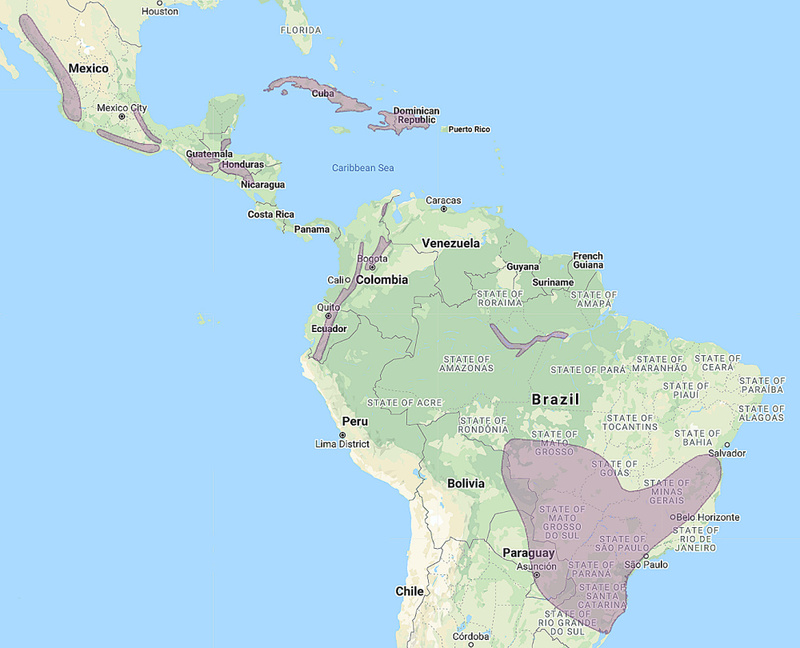 Distribution: It is found in parts of north-west and east Mexico, parts of Belize and Guatemala, in Cuba and the Isle of Pines, Hispaniola, Colombia, Ecuador, north-west and south Venezuela, south and central Brazil, all over Paraguay and north Argentina. Original Description: Wagler, Johann Georg. 1832. Isis, oder Encyclopaedische Zeitung, von Oken 25 (1817-1848 Jena): Col. 1221. Page by José Carlos Motta-Junior and Deane Lewis. Last updated 2016-02-01.